The graphic below is a screenshot from a site that is NOT for a law firm. As a matter of fact this company was raided by the Broward County Sheriffs and closed down. The site, www.newbeginningservices.us is still up as of 3/1/2017, although the raid was in August 2016, the principles were charged with UPL and unfair and deceptive trade practices, and the state attorney's office filed a formal complaint. "New Beginning Services can connect you with a private attorney in your area who is committed to defending your rights and working to get you the compensation you deserve. We make finding legal representation stress free by placing you in direct contact with a local attorney. Since the law places limits on how long you have to file a claim, call Legal Referral Services of Florida now to get a free confidential consultation with an attorney today! We have a panel of experienced attorneys in many areas of the law. 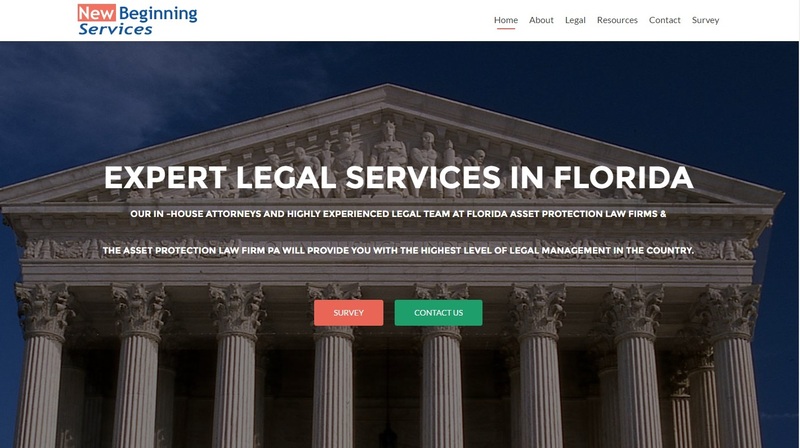 All of our attorneys are in-house, in good standing with the Florida bar association, have met specific experience requirements and must be experienced in the area of law for whom receives referrals. We have done the homework for you!" The company owners/ site owners are NOT attorneys. They could not legally own a law firm, and they could not legally have ANY attorneys in-house. "Our attorneys have a well-deserved reputation of excellence in providing smart, sensible, and cost-effective legal and business solutions for our clients. Each engagement benefits from the depth and breadth of our expertise. They are at the forefront of ever-changing laws and work closely with our clients in dedicated teams that are fully committed to exceeding client expectations. The complex, important, and often ground-breaking matters on which we work attract the best and brightest attorneys to join the group. Most of our attorneys choose to invest their entire professional careers with us. This allows us to offer a rare consistency of service to our clients, which further distinguishes us from other referral entities." Authorities say two phony lawyers set up an office in Coral Springs and drew in more than 300 trusting homeowners on the brink of losing their homes to foreclosure. Joseph Anton Hilton, 56, and Adam Forman, 46, owned The Asset Protection Law Firm, 3921 NW 126th Ave., which offered residential loan modifications and debt consolidation, authorities said. But neither Hilton nor Forman, both of Parkland, was licensed to practice law in Florida, police said. Each has been charged with practicing law without a license, a third-degree felony. Hilton is jailed on $250,000 bond; Forman is being held on $75,000 bond, jail records show. Additional charges are pending. According to the Florida Attorney General's Office, the pair "deceived homeowners into paying hefty upfront and monthly fees for legal services not supervised or approved by licensed attorneys." The state received 37 formal complaints from consumers, but police said the pair's client roster included more than 300 homeowners. Others may be implicated, police said, but there had been no further arrests as of Saturday. According to an attorney general's complaint, Hilton, who used the name Joseph Starr with clients, and Forman told homeowners not to pay their mortgages and ignore notices because the law firm would be dealing with their banks at a "higher level." They advertised a firm with an "elite network of over 100 attorneys"
The pair also deceived legitimate lawyers, mostly novices, and recruited them through Craigslist to work for their bogus law firm, officials said. Hilton and Forman used these legitimate lawyers' names and bar license information for corporate filings, retainer agreements with desperate homeowners and other legal documents, according to the attorney general's office. Court documents were filed using the real attorneys' information to delay foreclosures and allow Hilton and Forman to continue collecting monthly fees from homeowners, officials said. When homeowners tried to stop paying the phony law firm, Hilton and Forman used other tactics — threats and harassment, the complaint said. The pair, along with other employees, also ran bogus law offices in Boca Raton and West Palm Beach, officials said. Thursday, investigators raided the Coral Springs law office and hauled away stacks of boxes containing evidence. Hilton was arrested at the office; Forman was apprehended on an arrest warrant Friday, records show. When police arrived, there were about 15 employees working at the fake law firm, according to Sgt. Scott Myers. Some may be implicated in the crimes, he said. The bogus law firm has had several names, police said, among them: Consumer Legal Advocates II, LLC; Consumer Legal Advocates, Inc.; The Asset Protection Law Group, P.A. ; Oracle Marketing Co. and Consumer Legal Resources of Florida, LLC. "This is an active, ongoing investigation. We're interested in providing justice and fairness to everybody involved," Myers said. When bad actors such as these perpetrators pretend to be attorneys, take advantage of homeowners in foreclosure, and cause real financial damage they should be vigorously prosecuted. Incredibly, it took 37 consumer complaints before law enforcement closed them down. 37. Legitimate document preparation companies can be investigated with a whisper of an infraction and no consumer complaint. The Palm Beach County Office of the Attorney General filed the formal complaint on 8/18/2016 - read it here.